From low cost handling systems to sophisticated robotic palletising solutions, our experienced team are experts in replacing labour intensive handling operations with proven, reliable systems that are easy to operate and maintain resulting in significant efficiency and flexibility benefits. Eliminate inherent limitations in respect of product sizes, shapes, susceptibility to damage, product presentation, weight and restricted flow rates. CKF-designed palletising and depalletising systems can undertake even the most elaborate picking tasks from single, multiple or a full layer of products, aligning the stack either prior to or within the robot picking cycle and incorporating features such as vision recognition software to identify the exact location of the product before the pick. Additionally, products can be rotated and trays or bins emptied as part of the process. Our design expertise extends to its tooling, and can be as simple as a vacuum pick up, a multifunctional gripper or complex vacuum tooling with segmented zoning for multi drop applications. Pre-manufacture, the concepts are modelled in our 3D design software where they can be stress tested using Finite Element Analysis. With shelf space at a premium, we have developed a fully automated low-cost robot case packing system. The integrated system eliminates the need for manual packing and improves reliability, operating within a confined space; increasing flexibility and future proofing. The benefits are immediate and include greater output and day in day out consistency. Designed to support businesses with manual processes, our ready-made, low cost robotic packing system doesn’t require highly skilled operators; it is easily maintained and utilises a relatively small area of any shop floor. It handles medium to high speed repetitive tasks more efficiently over sustained periods than manual labour, with greater consistency and reduced wastage. From full turnkey palletising solutions to a simple economical cell for palletising a single product line, CKF is the UK’s leading integrator of robotic palletising solutions. These typically revolve around the ABB 4 axis IRB 660 robotic arm, although the IRB 460 is used for smaller cells and the IRB 760 for heavier loads. 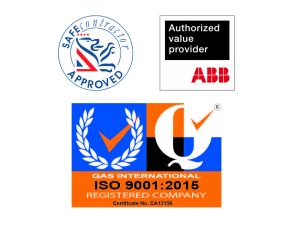 CKF Systems is one of only three UK companies to have been awarded Authorised Value Provider status from ABB, one of the world’s leading engineering companies. It recognises our ongoing investment, customer service standards, expertise in working with ABB robots and global achievements as a leading provider of automated handling solutions and robotic systems.